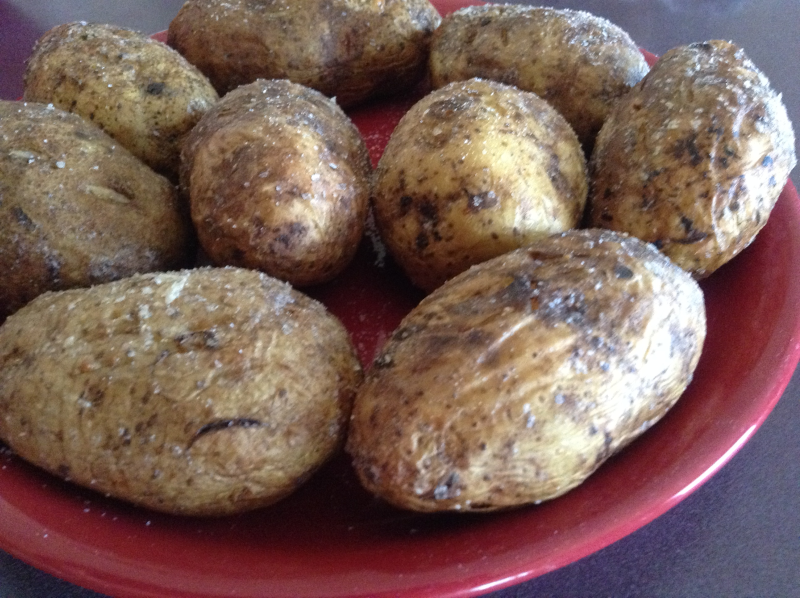 How to Make Perfect (and Easy) Baked Potaotes – Get Cooking! I’ve always loved a great baked potato. In fact, when at a favorite steak house, I’ve been known to get every bit as excited about the baked potato as I am the steak. Oddly enough, though, I’ve recently become an EVEN bigger potato fanatic. I have no explanations as to WHY but since I began eating Gluten Free, my cravings for baked potatoes are almost non-stop. My daughter Emily (who also recently had to begin eating Gluten Free) has similar cravings – only her potato of choice is sweet potatoes. Although I can’t explain the increased cravings, I can certainly take care of them. It just so happens I like my own baked potatoes as well as – and often better than – potatoes gotten at restaurants. Although it’s different from most people, I don’t wrap my potatoes in foil before putting them in the oven. To me, doing so kind of just”steams” the potato rather than “baking” it. I like for the skin to have a slight crispiness to it when I cut into it. If it doesn’t’ have that slight little crunch sound when the knife cuts into the potato, I don’t get quite as excited. Wash your potatoes well. I have a little scrub brush (fittingly in the shape of a potato, because I’m quirky like that) that I like to use on my potatoes. After they’ve been washed well, oil them down with butter, vegetable oil, or olive oil. It’s like you have a little spa for potatoes and you’re the masseuse. I roll my greased up potatoes in a little sea salt or Kosher salt. Trust me, this little extra step makes a world of difference. Pierce your potatoes about 4 or 5 times to allow steam to escape. DO NOT SKIP THIS STEP. An exploding potato is a hideous thing. Bake your potatoes directly on a rack in a 400 degree preheated oven for 45 – 50 minutes. Place a cookie sheet on a lower rack to catch any drippings. The timing depends upon the size (density) of your potatoes. There are several ways to check to make sure your baked potato is cooked thoroughly. Below are the most commonly used (with my own personal method listed first). Use an oven mitt to give the potato a slight little squeeze. If there’s a bit of “give,” the potato is done. If there’s no “give,” return it to the oven. You can also check for a potato’s done-ness by taking its temperature. The internal temperature should be 210 degrees F.
Some people check their baked potatoes by piercing them with a fork. If the fork doesn’t meet any resistance, they know it’s showtime. And showtime is a beautiful thing.